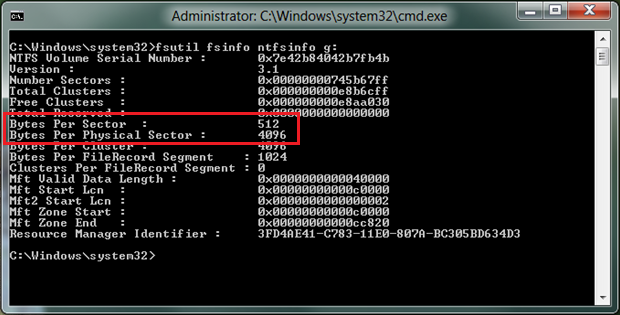 This article is an updated version of the article titled 512-byte Emulation (512e) Disk Compatibility Update which was released for Windows 7 SP1 and Windows Server 2008 R2 SP1. This update contains much new info, some of which is applicable only to Windows 8 and Windows Server 2012. Areal densities are increasing yearly, and with the recent advent of 3 TB disks, the error correction mechanisms used to deal with the decreasing signal-to-noise-ratio (SNR) are becoming space inefficient; that is, an increased amount of overhead is required to ensure the media is usable. One of the storage industry solutions for improving this error correction mechanism is to introduce a different physical media format that includes a larger physical sector size. This new physical media format is called Advanced Format. Therefore, it is no longer safe to make any assumptions regarding the sector size of modern storage devices, and developers will need to study the assumptions underlying their code to determine if there is an impact. This topic introduces the effect of Advanced Format storage devices on software, discusses what apps can do to help support this type of media, and discusses the infrastructure that Microsoft introduced with Windows Vista, Windows 7, and Windows 8 to enable developers to support these types of devices. While the material presented in this topic provides guidelines for improving compatibility with Advanced Format disks, the info applies generally to all systems with Advanced Format disks running Windows Vista, Windows 7, and Windows 8. The below list summarizes the new features delivered as part of Windows 8 and Windows Server 2012 to help improve customer and developer experience with large sector disks. More detailed description for each item follow. **Logical sector:** The unit that is used for logical block addressing for the media. We can also think of it as the smallest unit of write that the storage can accept. This is the emulation. **Physical sector:** The unit for which read and write operations to the device are completed in a single operation. This is the unit of atomic write. Most current Windows APIs, such as IOCTL\_DISK\_GET\_DRIVE\_GEOMETRY will return the logical sector size, but the physical sector size can be retrieved through the IOCTL\_STORAGE\_QUERY\_PROPERTY control code, with the relevant info contained in the BytesPerPhysicalSector field in the STORAGE\_ACCESS\_ALIGNMENT\_DESCRIPTOR structure. This is discussed in more detail later in the article. 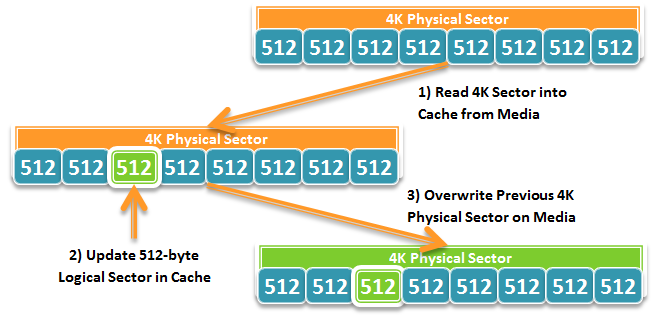 **4 KB native:** This media has no emulation layer and directly exposes 4 KB as its logical and physical sector size. The overall issue with this new type of media is that the majority of apps and operating systems do not query for and align I/Os to the physical sector size, which can result in unexpected failed I/Os. **512-byte emulation (512e):** This media has an emulation layer as discussed in the previous section and exposes 512-bytes as its logical sector size (similar to a regular disk today), but makes its physical sector size info (4 KB) available. The overall issue with this new type of media is that the majority of app and operating systems do not understand the existence of the physical sector size, which can result in a number of issues as will be discussed below. This table documents the official Microsoft support policy for various media and their resulting reported sector sizes. See this KB article for details. All Windows versions from Windows 7 SP1 and beyond. All Server versions from Server 2008 R2 SP1 and beyond. *Except for Hyper-V. See the "Application support requirements for large-sector drives" section. While not stressed in the preceding table, Windows XP, Windows Server 2003, and Windows Server 2003 R2 do not support 512e or 4Kn media. While the system may boot up and be able to operate minimally, there may be unknown scenarios of functionality issues, data loss, or sub-optimal performance. Thus, Microsoft strongly cautions against using 512e media with Windows XP or other products based on the Windows XP codebase (such as Windows Home Server 1.0, Windows Server 2003, Windows Server 2003 R2, Windows XP 64-bit Edition, Windows XP Embedded, Windows Small Business Server 2003, and Windows Small Business Server 2003 R2). A storage medium has a certain unit within which the physical medium can be modified. That is, the media can only be written, or rewritten, in units of the physical sector size. Thus, writes that are not performed at this unit level would require additional steps, which we will walk through the example below. While this may initially appear to be only a performance issue, there can be more serious issue. Let s discuss this in the next section. Resiliency speaks of the ability of an app to recover state between sessions. We have seen what is necessary for a 512e storage device to perform a 512-byte sector write the Read-Modify-Write cycle. Let s look at what would happen if the process of overwriting the previous physical sector on the media was interrupted. What would be the consequences? Because most hard disk drives update in place, the physical sector that is, the portion of the media where the physical sector was located could have been corrupted with incomplete info due to a partial overwrite. Put another way, you can think of it as potentially having lost all 8 logical sectors (which the physical sector logically contains). While most apps with a data store are designed with the capability to recover from media errors, the loss of eight sectors, or put another way, the loss of eight commit records, can potentially make it impossible for the data store to recover gracefully. An administrator may need to manually restore the database from a backup or may even need to perform a lengthy rebuild. One more important impact is that the act of another app causing a Read-Modify-Write cycle can potentially cause your data to be lost even if your app is not running! This is simply because your data and the other app s data could be located within the same physical sector. With this in mind, it is important that app software reevaluate any assumptions taken in the code, and be aware of the logical-physical sector size distinction, along with some interesting customer scenarios discussed later in this article. While some storage vendors may be introducing some levels of mitigation within certain 512e storage devices to try to ease the performance and resiliency issues of the Read-Modify-Write cycle, there is only so much any mitigation can handle in terms of workload. As such, apps should not rely on this mitigation as a long-term solution. Moreover, there is no guarantee that all classes of disks will have this mitigation in place, nor is there a guarantee that the mitigation is well-designed. The solution to this is not in-drive mitigation, but to design apps to do the right set of things to help support this type of media. This section discusses common scenarios where apps may have issues with large sector disks, and suggests an avenue of investigation to try and resolve each issue. When the administrator/user partitions the disk, the first partition may not have been created on an aligned boundary. This may cause all subsequent writes to become unaligned to physical sector boundaries. As of Windows Vista SP1 and Windows Server 2008, the first partition is placed at the first 1024 KB of the disk (for disks 4GB or larger, otherwise the alignment is 64 KB) that is aligned to a 4 KB physical sector boundary. However, given the default partitioning in Windows XP, a 3rd party partitioning utility or incorrect usage of Windows APIs, created partitions may not be aligned to a physical sector boundary. Developers will need to ensure that the correct APIs are used to help ensure alignment. The recommended APIs to help ensure partition alignment are outlined below. The IVdsPack::CreateVolume and IVdsPack2::CreateVolume2 APIs do not use the specified alignment parameter when a new volume is created, but rather use the alignment value default for the operating system (Pre-Windows Vista SP1 will use 63 bytes, and post Windows Vista SP1 will use the defaults stated above). Instead, use the IVdsCreatePartitionEx::CreatePartitionEx or IVdsAdvancedDisk::CreatePartition APIs that use the specified alignment parameter for those apps that need to create partitions. The best way to help ensure that alignment is correct is to do it right when initially creating the partition. Otherwise your app will need to take alignment into account when performing writes or at initialization which can be a very complex process. The simplest issue is that unbuffered writes are not aligned to the reported physical sector size of the storage media. Buffered writes, on the other hand, are aligned to the page size 4 KB which coincidently is the physical sector size of the first generation of large sector media. However, most apps with a data store perform unbuffered writes, and thus will need to ensure these writes are performed in units of the physical sector size. **Commit records are padded to 512-byte sectors:** Apps with a data store typically have some form of commit record that either maintains info about metadata changes or maintains the structure of the data store. In order to ensure that the loss of a sector does not affect multiple records, this commit record is typically padded out to a sector size. With a disk with a larger physical sector size, the app will need to query for the physical sector size as shown in the prior section, and ensure each commit record is padded to that size. With a 4K disk, this ensures I/Os do not fail. With a 512e disk, not only does this avoid the Read-Modify-Write cycle, it helps ensure that if a physical sector was lost, only one Commit Record would be lost. **Log files are written to in unaligned chunks:** Unbuffered I/O is typically used when updating or appending to a log file. Apps can either switch to buffered I/O, or internally buffer the log updates to units of the physical sector size to avoid failed I/Os or triggering a Read-Modify-Write. To help determine if your app issues unbuffered I/O, make sure to include the FILE\_FLAG\_NO\_BUFFERING flag in the *dwFlagsAndAttributes* parameter when you are call the CreateFile function. Windows Vista and Windows Server 2008 introduced APIs to query for the physical sector size of the attached storage device for AHCI-based storage controllers. With Windows 7 and Windows Server 2008 R2, as of SP1 (or Microsoft Knowledge Base 982018), this support is extended to Storport-based storage controllers. Microsoft has provided a code sample on MSDN detailing how an app can query for the physical sector size of the volume. There are many scenarios where the reported physical sector size of the underlying storage that hosts the Datastor may change. The most common of these is when you migrate the Datastor to another volume, or even across the network. A change in the reported physical sector size may be an unexpected event for many apps and potentially can result in some apps failing to re-initialize. This is not the easiest scenario to support, and is mentioned here as an advisory. You should consider the mobility requirements of your customers and adjust your support accordingly to help ensure customers are not negatively impacted by using 4K native or 512e media. If the Byte Per Physical Sector field displays Not Supported then either the storage driver does not support IOCTL_STORAGE_QUERY_PROPERTY, or there was an error in retrieving the info.